Tell us a bit about your background. Where were you born? When did you come to the U.S.? I was born in Tehran and came to the United States in 1978 with my family. I have lived in the Washington, D.C. area for most of my life since that time. I have been an athlete since I can remember. I began to compete in Taekwondo at the age of 6 . My father was my trainer when I was young as he was schooled in many forms of martial arts and combat. I have also trained under a renowned Korean instructor and have trained in Korea for two years with Korean national and world champions. In my career in Taekwondo, I was involved in countless competitions and hold the rank of 5th degree black belt. I have won international, national and state championships and competed at the 1988 Olympic trials. I also won the 1986 Grand Championships at Madison Square Garden in New York. -- It's unusual for women to become boxers. What inspired you? I have always strived to be the best I could be in anything I was a part of. By 1998 I felt I had accomplished all I could in Taekwondo -- as a competitor. I have always believed in a challenge and felt the sport of women's boxing presented me with just such a challenge. Women's boxing at the amateur and professional level is growing rapidly and will more than likely be an Olympic sport at the 2004 games in Athens, Greece. It is now my goal to become the first woman ever to win an Olympic gold medal in the sport. The combination of the challenge of being the best in the world and being the first woman to ever achieve winning a gold medal in the sport is inspiration enough. -- Give us more details about your amateur career. I have been training as a boxer since the summer of 1998. I wanted to be the best in the sport at the proper moment, so I have limited my competitions since that time to concentrate on technique, form, power and speed. 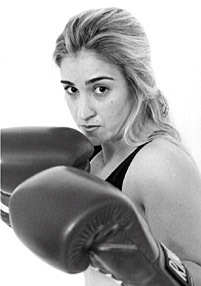 I was ranked among the top 10 women in the United States in 1999 and plan on reaching my full capacity as a boxer this year. I will compete at the United States National Golden Gloves tournament in August, the United States National Championships in September, the International Turku Cup in Finland in October and the first ever Women's World Amateur Boxing Championships here in the United States in November. My immediate goal is to be the best woman amateur fighter, pound for pound, in the world by the end of the year. I also compete as a natural bodybuilder and plan to enter competitions in April and again in May of this year. -- You are also active in other sports and as a fitness instructor. Tells us about these activities. As I mentioned, I am also a natural bodybuilder. I feel promoting a drug-free lifestyle is very important. I also feel proper fitness and nutrition in the making of an athlete sets a good example for others. I love to work with children and feel teaching them forms of martial arts helps to promote discipline, good manners, inner strength and courage. I also work with women in forms of self-defense to help them protect themselves in today's world. I believe that people of all ages should look to their inner strength to guide them and feel such things as boxing, martial arts and other forms of fitness activities can only help to make us all better people. Many look to me as a role model and as such, I understand the responsibility that comes with it. In that vein, I plan to open a martial arts and boxing center through my company, Platinum Fitness, Inc. in Potomac, Maryland by this summer. There we will teach these attributes to young children and women alike. This facility will not be a "boxing gym" in the classic sense, but teach Taekwondo, self-defense for women, boxing instruction, cardio and strength training and supervised fitness instruction. Once successful, I plan to expand this concept to other facilities elsewhere to help promote my ideas of fitness and well being. -- What are your short and long term goals? My goals are a basis for my life. I wish to be successful in business of course. I also wish to accomplish those things as an athlete that have not been done before. I set my goals high for one purpose, to make them hard to achieve. I believe that anything worth accomplishing in life should never come easily. For if it comes with too great an ease, those accomplishments are not truly appreciated. I have set all my goals down in my mission statements that can be found on my website. I published them for all to read both to serve as a personal challenge to myself as well as the hope that it might inspire others to achieve a "greatness" of their own in whatever they choose to do. -- How would you describe individual and professional opportunities in the U.S.? I believe the opportunities for people in the United States are tremendous. I feel we often limit ourselves though in what we believe we can achieve. To try and to fail; if it is a glorious attempt, is far greater a measure of the soul than not to have had the courage to even have made the attempt. As an individual, you are only limited in your ability to grasp what is not yet yours. As a professional, education and dedication to a goal are the keys to success. Whether you be a woman or a man, you are not limited in how far you can go, simply in how far you believe you can go. As an athlete and as a businesswoman, I believe fully in my abilities and that with hard work, perseverance and dedication, I can achieve anything I set out to do. The challenge to all of us is to overcome that voice inside that calls to us to be cautious and to take care; never reaching out for the fruit at the end of the branch. I say to those that I work with each day to remember that the fruit at the end of the branch is the sweetest, but reserved for those that have the courage to reach for it. This interview was conduced via email.